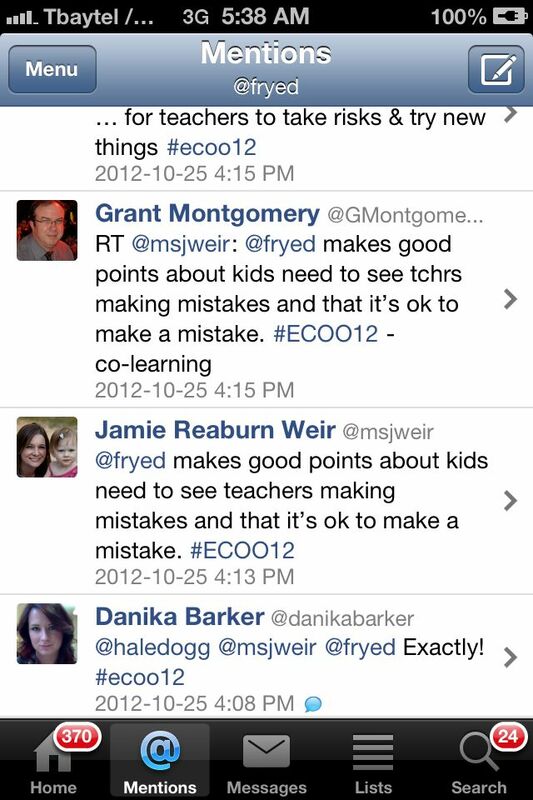 One of the major “take-aways” from this year’s ECOO Conference (#ECOO12) was the idea of needing an environment to “tinker” (John Seely Brown) where mistakes and false starts are just a learning pathway. “FAIL” is really just “First Attempts in Learning”. We talk a lot about creating a culture of support for children/students, where risk-taking is encouraged in the classroom. But what about teachers? If we are to move forward with the integration of technology to enhance learning (Michael Fullan), then we need our teachers to feel supported in their attempts to exit their default methods and try new strategies. As a Principal, I need to create an environment where we are all learners. Teachers model their attempts to enhance learning for students, and students become accustomed to a classroom where even the teacher isn’t afraid to try and to fail. Even Principals need to have First Attempts at Learning in front of their students, teachers and peers. Yesterday, some senior students asked me to join their class for a discussion on how we could better leverage technology for learning. As I walked in, a student was teaching another group of students how to embed a clustr map on their blogs/digital portfolios. He was excitedly explaining how ‘cool’ it was that people from Australia and India were looking at his artworks and commenting on his designs. I was impressed with how much HTML the students had taught themselves (we have no coding classes at our school – yet) and how well they understood embedding code in their blogs. Rogan’s art portfolio. Hey world, take a look at what I do in school! I decided to share this moment with other principals in our board, so today I asked the students to Skype into our principals’ meeting and share with us their experiences in working with authentic audiences. Of course, the technology was not cooperating, and it took several attempts before we could find the bandwidth we needed to have the conversation progress (all of this in front of a restless audience, right before lunch). But we talked about FAIL, and how next time we want to skype with students, we will approach it differently because now we know that school wifi is not sufficient bandwidth, and we will set up iPhone hotspots right from the start. 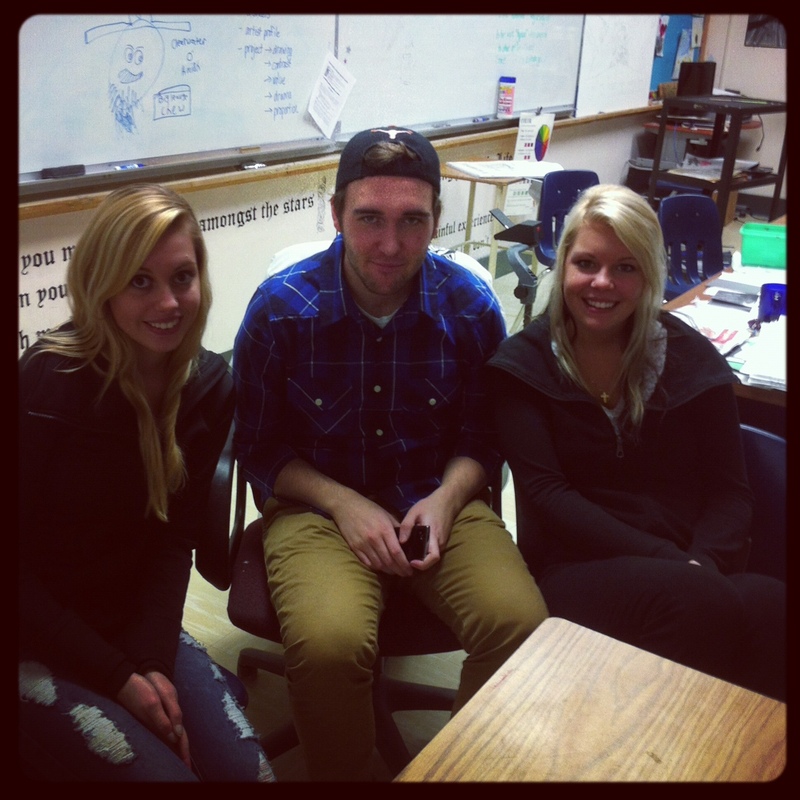 NRRDHS senior art students wait to skype with principals. In the end, the students and their teacher did a beautiful job of presenting their experiences in sharing their artworks with the world. They made a lasting impression on the principals in the room. They demonstrated the value of rich tasks, and we all shared the need to work in an environment where trying is more important than having success right from the start. We try, we watch, we help, we share, we encourage, and as a result, we learn. A great reflection after an absolutely wonderful day. I am so proud of our students and their willingness to share their thoughts with a new audience. The conversation was transformative, and I feel that students, teachers and administration worked together toward a common goal. There is a need and a growing curiosity that is beginning to be nurtured as we explore and experiment with technology and its usefulness. The strength and flexibility of students should affect our learning as they model for us: they are the ones who are willing to take risks in so many ways. They continually explore new media and problem-solve to achieve goals. Adaptation is routine. Change happens. Thank you for promoting collaboration and interaction between so many levels of learners today. It was so exciting!